Did you have snow recently? We just had a light sprinkling but the drop in temperature prompted me to up the ante and make sure that my skin was well protected from the elements. We have an open fire daily so between that and the central heating, I really should resemble a shrivelled prune but thankfully, I don't! It's not necessary to switch up your routine completely but a few small changes can make a big difference when it comes to winter-proofing your skin. Cleanser: To remove my makeup, instead of using a micellar water, in winter, I like to use a cleansing oil and my current go-to is L'Occitane Immortelle Make-Up Remover. This is so gentle yet it melts away every scrap of makeup/liner/mascara. A little goes a long way and whilst it doesn't leave any residue on the skin, it does feel nourishing. I then follow with a cleansing balm and my current choice is Omorovicza Thermal Cleansing Balm because it's nourishing and ensures that my skin is thoroughly cleansed without feeling stripped. Exfoliator: I use acids on a regular basis but my daily staple is Pixi Glow Tonic. This is a gentle, yet effective way to ensure skin looks fresh and bright. One swipe on a cotton pad will remove dead skin cells but it isn't harsh due to the inclusion of aloe vera so it's perfect for everyday use. Hydrate: A hydrating mist is a winter essential, not just as part of your skincare routine but also to rehydrate throughout the day. I'm currently using Emma Hardie Plump & Glow Hydrating Mist, which is packed with hyaluronic acid and aloe vera, both of which hydrate, soothe and comfort the skin. I then follow with a few drops of Omoressence, (review here) which is a Godsend for dehydrated skin. In addition to this, I love to use a hydrating serum and my favourite is Image Skincare Ageless Total Pure Hyaluronic Filler. (Review here). This serum instantly quenches my skin's thirst and plumps it so that all signs of dehydration are banished. Brighten: Having dry skin that is naturally prone to dullness, I have to work extra hard in winter for my skin to appear bright and radiant. 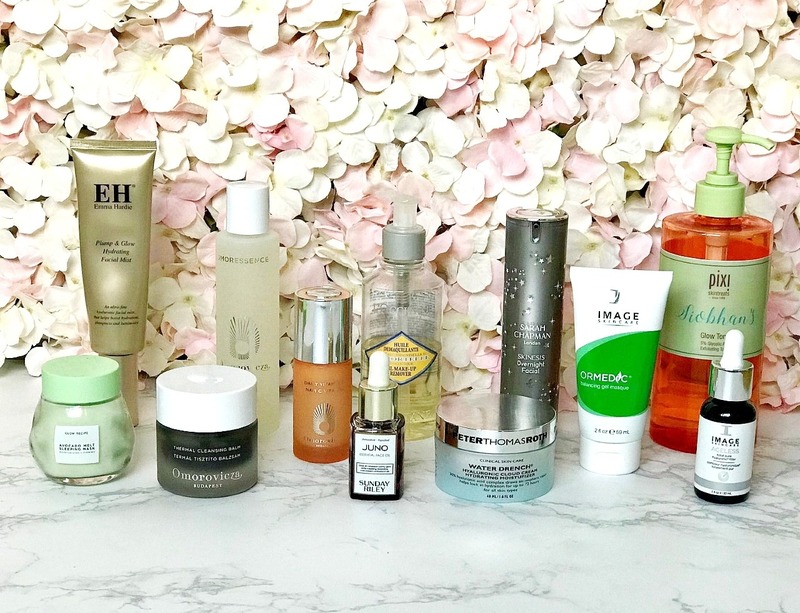 This is where Vitamin C products are essential and I am currently using Omorovicza Daily Vitamin C. It's too early to give a full review but there will be one next month so keep your eyes peeled for that. Moisturiser: Peter Thomas Roth Water Drench Cloud Cream is as dreamy as it sounds! It is comprised of 30% hyaluronic acid and although it is very lightweight, it really packs a punch in terms of moisture. It absorbs instantly and doesn't leave any residue but skin feels hydrated for hours after application. Oil: Sometimes I will add a few drops of oil to my moisturiser in the morning for an extra boost. For this I will use Sunday Riley Juno (review here), which really nourishes my skin and adds some glow. At night, I will use Sarah Chapman Overnight Facial (review here). Mask: Two or three times a week, I will use a mask as an extra boost for my skin and the two I am rotating between at the moment are Image Ormedic Balancing Gel Masque and Glow Recipe Avocado Melt Sleeping Mask. The Image mask is particularly good for stressed, reactive or weather-beaten skin because it instantly soothes and cools the skin. It also helps to heal the skin so if you have patches of dryness or acne, this mask will work wonders for you. It contains aloe vera, cucumber, calendula, chamomile and other soothing and hydrating ingredients. It really does restore balance to the skin and the gel texture is cooling so it is a treat to use on sore or irritated skin. The Glow Recipe mask is a rich buttery mask that instantly quenches my skin's thirst and replenishes my skin overnight, resulting in plump, glowing skin. Have you upped your skincare game this winter? What are your favourite products to use? All products are bought by me, unless otherwise stated. The L'Occitane cleansing oil, Image products and Omorovicza Vitamin C serum were kindly sent to me as was the Pixi Glow Tonic but that has been a staple in my routine for years and I have purchased it many times myself. Opinion is always my own. This is not an ad as I was not paid to write it. Affiliate links may be used.